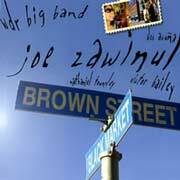 Brown Street, the Zawinul/WDR Big Band album due for a November release in Europe, will be distributed in the United States by Heads Up International, a division of Telarc. 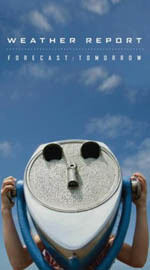 Plans call for a January 2007 release in the US, but those things have a habit of changing, so stay tuned. The line-up for the Zawinul Syndicate shows here in the US will be Zawinul, Linley Marthe on bass, Aziz Sahmaoui on percussion and vocals, Alegre Corréa on guitar, Jorge Bezerra on percussion, and Roger Biwandu on drums. 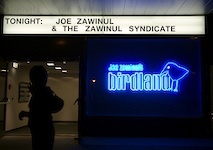 A business trip to Europe afforded me the opportunity to catch the Syndicate for two nights at Joe Zawinul’s Birdland in Vienna. The band was smoking, performing before an appreciative audience that was standing-room only both nights. Paco Sery was in the drum seat for the first time in a few years, and the rhythm section with Linley Marthe was superb. The second night I was there I was able to take some photographs, and I’ve posted a gallery from the September 21 show. Click the photo to go to the gallery. Zawinul Online readers can get a 25% discount on tickets for the Zawinul Syndicate’s October 27 and 28 performances at the Rose Theater in New York. This offer is available when purchasing tickets at the box office or by telephone only. You merely need to say “Jazz 25” and you’ll get a 25% discount. Sony has delivered the Weather Report boxed set, titled Forecast: Tomorrow, and there aren’t any surprises from what we wrote back in February 2005. The three audio CDs consist almost entirely of tracks culled from Weather Report’s Columbia albums. The exceptions are a DJ Logic remix of “125th Street Congress,” an unissued recording of “Directions” from the I Sing the Body Electric studio sessions, and a live performance of “Nubian Sundance” from December 1974. The DVD is the September 28, 1978 performance at Offenbach Stadthalle that was broadcast on Germany’s Rockplast television show. Poor quality reproductions of this show have been in circulation among tape traders for years, and it was packaged as the bootleg DVD “Young and Fine.” But Forecast: Tomorrow‘s DVD is far superior in reproduction quality, and that alone will make this boxed set worthwhile for many fans. Also of note is the 100-page booklet, with a lengthy essay by jazz historian Hal Miller, with quotes from many of the Weather Report band members. In particular, Wayne Shorter’s comments on his compositions are most welcome. However, the notes are marred by errors, such as the wrong date for the Offenbach concert (an editing flub on Sony/Legacy’s part—Peter Erskine gave them the correct date when he wrote the notes for the DVD). Long-time Weather Report fans likely already have the music contained in the box set, and so may be hard-pressed to justify the nearly $50 price tag. Essentially, the fifty bucks gets them the concert DVD, the booklet, and a nice box. On the other hand, the DVD is the best video recording of Weather Report available. For casual Weather Report fans, or more recent Zawinul fans, the boxed set is a good overview of the band’s history. Similarly, Jaco fans familiar only with Weather Report’s Jaco years will find that Forecast: Tomorrow puts those years into perspective, not to mention that the DVD contains probably the best Jaco concert footage you’ll find. 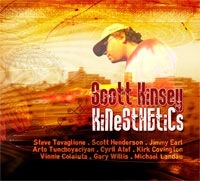 I received an advanced copy of Scott Kinsey’s long-anticipated new CD, Kinesthetics, the other day, and it was worth the wait. Kinsey is best-known as the keyboardist for the band Tribal Tech, and he’s come to be regarded by many as a master of music synthesizers and sound. Indeed, Kinsey is one of the few keyboardists I can think of who has legitimately inherited Zawinul’s mantle as an innovator on the synthesizer; a keyboardist who has developed his own voice on the instrument. Kinsey’s sound canvas seems to have no bounds. Over the past couple of years Scott has been building his own body of work and performing regularly at L.A. jazz clubs. His new CD is the culmination of that work, and I can tell you it is among the best CDs I’ve heard in a while. Zawinul’s influence is clearly evident, but this music is uniquely Kinsey. And listening to Kinesthetics makes clear the influence that Scott had on Tribal Tech’s last two albums, both of which had a looser vibe than their predecessors, relying on in-the-moment improvisations rather than written compositions. That loose vibe carries forward in Kinesthetics. This album is likely to be lumped into the “fusion” category, but it isn’t your typical fusion chops-fest. Rather, it is—for lack of a better description—Kinsey music. Fresh, innovative, and funky. Recommended. I drove by Tower Records in Santa Clara today, not planning to stop, when the “Store Closing” sign caught my eye. I knew Tower was the subject of a bankruptcy auction this week, but I had assumed that somehow the venerable music retailer would keep its doors open. That’s not to be. The liquidator that won yesterday’s auction wasted no time in getting busy with the liquidation. Every Tower Records store nationwide began the process of closing today, and they’ll probably be gone by the end of the year. I’m going to miss Tower Records. I grew up in Southern California, and I remember when an outing to Tower’s Hollywood super store on Sunset Boulevard was a special treat. It was like going to Mecca. Back then, the Internet didn’t exist. Neither did Amazon or WalMart. Tower was where you kept up with what was happening, to hear something new, to chat with fellow customers and musicians, to browse the racks and (hopefully) come home with some new gems for the record player. My wife got interested in jazz when she heard it a Tower one day. I still like browsing at record stores, but the options in my neck of the woods are becoming pretty limited. True, we do have Borders and Barnes and Noble, and they do have those cool stations that let you listen to snippets of tracks on any CD in the store (a feature that’s saved me a fair amount of money). But those stores have a sterile atmosphere compared to Tower. It just isn’t the same. Meanwhile, a few blocks further down the road I noted that Big Al’s Record Barn remains open for business. He’s been selling nothing but vinyl for 30 years, and he’s got some of my old vinyl on his shelves. How much longer he’ll be at it is anybody’s guess, but God bless the Big Als of the world. The Zawinul/WDR Big Band album mentioned here back in November 2005 is due out in Europe on November 10. It’s listed on the Amazon Germany site. No word yet on distribution in other parts of the world.